Our best selling DVD - College Algebra Tutorial DVD. Recommend for High School Algebra 2 students. Also college students taking College Algebra or other algebra courses. Good review for ACT and CLEP takers. Linear Equations, Solving Linear Equation containing two variables, Functions, Evaluating functions, Linear Functions (lines). Polynomials, Factoring, Greatest Common Factor, Difference of Squares, x^2+bx+c form, ax^2+bx+c form, Grouping, P&Q method (also called M&N method), Quadratic Functions, Zero Product Rule, Square root Method, Completing the Square, Quadratic Formula, Quadratic Functions (parabolas-vertex), Exponential Functions, Logarithmic Functions, Compound Interest, Word Problems, Bonus material - Fractions Review and Using the graphing calculator. CLEP Tutorials. So what is the CLEP and why is it important to students? The CLEP allows you to receive college credit for knowledge you already know. You may have taken a Algebra class somewhere that did not transfer or are willing to study for it. It is best to already know something about the subject before trying to tackling the exam. But you can pass it if you are willing to put in the time to study for it. There are 34 exams covering Composition & Literature, Forieng Languages, History and Social Sciences, Science and Mathematics, and Business. Taking the test cost less than $100 and you can receive 3-4 credits towards your degree. That saves you time because you don't have to take the class at your college and that saves you money because 3 credits can costs you $100s or $1000s of dollars. The college board sells Individual Study Guides for each of these tests. They each consists of 50 practice questions and sell for $10. These guides have questions and answers but no study material or solution manual. So you won't know how to solve the problems you got wrong or be able to effectively study for the exam. That is why we made our own solution manual for those exam guides. 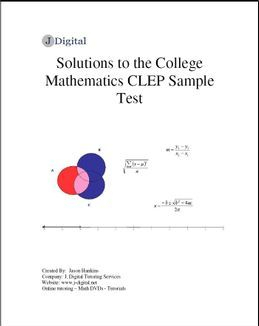 We currently have solution guides to the College Mathematics CLEP and the College Algebra CLEP. They are listed below and can be purchased for only $5. Need some help with your homework, practice tests, test questions? Let's us work out the problem for you so you will know how to do it. We take Algebra and Probability/Statistics questions all the way through college level material. We are also well versed in other math subjects, just ask us if we can solve it. We also help with ACT, SAT, or other exam math questions. The answer will be hand written and scanned and emailed to you in a few days. Please limit your questions to a max of 10 at a time. Homework solutions service.